Construction of the railroad commenced westward from Carlton, Minnesota on February 15, 1870. Construction efforts eastward began in Washington the following year, with the two points expected to join in Montana. The railroad, when completed, spanned between Minnesota and Washington state, connecting the Great Lakes to the Pacific Ocean. Ahead of the line, operations consisted of establishing military posts and securing land for the railroad. Northern Pacific Railway was entitled to every other section of land within 40 miles of its road and principally responsible for selecting townsites. The earliest impetus towards establishing what became Bismarck came in September 1871, when Northern Pacific awarded contracts for constructing the railroad between the Red and Missouri Rivers. An expedition commenced from Fort Rice on September 6th, 1871 to locate the railroad through western Dakota Territory and eastern Montana. It consisted of seven companies of infantry (totaling 420 men), twenty-two mounted Indian scouts, twenty-five Northern Pacific engineers, and seventy “teamsters” and Government employees. Among them was Thomas H. Canfield – president of Puget Sound, Northern Pacific’s auxiliary townsite company – who was chiefly accountable for locating potential town sites along the railroad’s path. General Whistler was in charge of the expedition itself, while General Thomas Rosser was responsible to the engineering team. Rosser – a former confederate soldier – was chief engineer of the railroad’s Dakota Division. By the spring of 1872, the railroad was established to the Red River and had been located to the James River. Progressing at a rapid pace, the railroad was expected to reach the Missouri River by autumn. 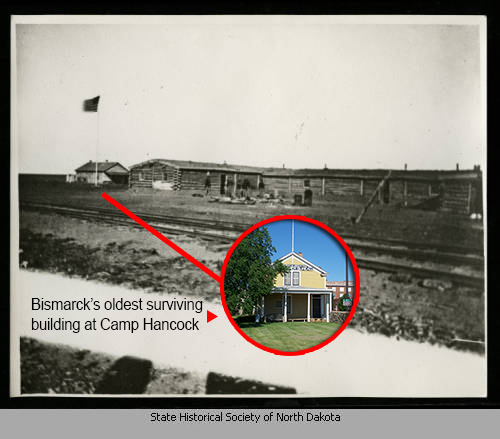 What would eventually become Bismarck is generally considered to have been founded on May 14, 1872, when Colonel George W. Sweet – a lawyer for Puget Sound – took possession of land on behalf of the railroad line and townsite. The town was not where Northern Pacific intended, however. The town was to be located immediately along the riverfront where the railroad was originally expected to span, at the mouth of the Heart River, commonly referred to as “The Crossing” or “The Point.” This would have positioned the town directly across from what is now Fort Abraham Lincoln State Park, roughly three and-a-half miles south from its eventual location. Early prospectors hoping to benefit from the principle of adverse possession, colloquially known as “squatter’s rights,” interfered with Northern Pacific’s plans by staking land claims along the projected route. These squatters sought to profit from what was expected to become a bustling city. At least two individuals who possessed privileged knowledge of the railroad attempted to take advantage of their priceless intelligence: John Jackman and Doctor Walter Burleigh. Their antagonistic efforts triggered a townsite contest that lasted for years, casting serious doubt on the sanctioned town’s location and stunting permanent development. Financed by competing railroad tycoon James Hill, John J. Jackman – a member of Colonel Sweet’s crew, resigned upon discovering the Missouri River’s crossing. He organized a five-man gang to preempt land claims ahead of Colonel Sweet. His party arrived only hours before Sweet, on May 13th, occupying roughly two miles along the riverfront. To the east, on or near the present-day site of Bismarck Airport, Doctor Burleigh, who held the contract to grade the 50-mile line up to the river, leveraged his knowledge to assert land. Sweet, who had no legal remedy against squatters, retreated to a site roughly two miles east of the river. Eager to promptly procure unencumbered land, Sweet hired individuals to take personal possession of land at the new site under the condition that they would sell it to the railroad once proper title could be conveyed. When Jackman learned of Sweet’s latest endeavor, he encouraged others to thwart Sweet’s land claims. Governor Jay and others also contested land in the new townsite. This inevitably lead to a townsite contest that lasted for five years. Despite these latest endeavors by squatters, Northern Pacific proceeded at the new town site and adjusted its line accordingly, to the north. The town was officially christened “Edwinton” on August 17th (one source says August 24) by order of Northern Pacific. Edwinton was named for Vermont native Edwin Ferry Johnson, Northern Pacific’s former chief engineer who first lobbied for constructing the northern transcontinental railroad. Johnson was a friend of Thomas Canfield. Few believed the authenticity of the changed railroad route and townsite location. Many suspected it was a scheme disguised to outwit squatters from Northern Pacific’s actual target. After all, grading work had already been completed along the original path. Even so, there was doubt in Northern Pacific’s ability to fend off squatter claims in Edwinton itself. On the other hand, some alleged that the original route itself was a tactical deception, a strategic attempt by Northern Pacific to thwart squatters from inception. With the townsite location seemingly unresolved, so-called “tent cities” erupted along the original projected route, namely Carleton and Burleigh City (also known as “Burleighton”). These tent cities thrived in Edwinton’s shadow, swelling to roughly 200 individuals and businesses ranging from saloons to trading posts. Carleton City, named for Charles Carleton Coffin, sprouted along the riverbank near the original crossing, directly across from Fort McKeen (later named Fort Abraham Lincoln). Burleigh City was established further east, on or near the present-day site of Bismarck Airport. Burleigh City and the original railroad path, along with Edwinton, are even marked on one of the earliest survey maps of the region. The change was no ruse, and the revised railroad line as it is ultimately laid was final. The squatters’ stratagem backfired and Edwinton, now Bismarck, became the sanctioned city. Burleigh City failed quickly, but Carleton, benefiting from nearby Fort McKeen/Abraham Lincoln, prospered for years. Edwinton faced ongoing land claim obstacles. Land ownership couldn’t be guaranteed, which stunted permanent development. The earliest structures were made to be portable with the expectation that they could be forced to move. The squatters’ actual impact on the line change is debatable. One other significant cause for the northward shift was to avoid the lowland area’s susceptibility to flooding. It’s very likely that the line was altered regardless of the squatters’ claims. The track was laid to within forty-five miles of the Missouri River by the fall, but a strong winter storm in October delayed construction of the railroad until spring. Established in April 1872, Camp Greene was perhaps the first modern settlement in the region. It was intended to be the primary depot supporting railroad development. Named for its commander, Lieutenant Greene, the camp was located at the mouth of the Little Heart River, approximately three miles south of where Fort McKeen (Fort Abraham Lincoln) would be established. at the mouth of the (big) Heart River. 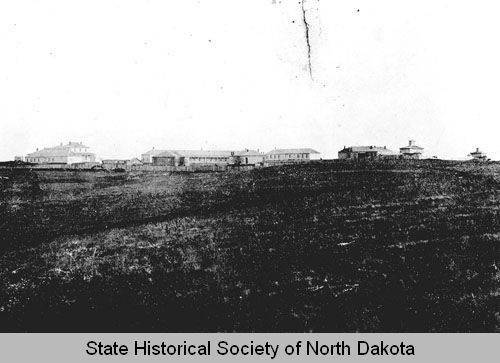 In June, the military commissioned Fort McKeen (renamed Fort Abraham Lincoln in November, by order of General Sheridan) on the west side of the Missouri River near the proposed river crossing, at the mouth of the Heart River, the site of an abandoned Mandan village. The fort’s original namesake was a staff officer for General Hancock. By September, a news report stated that the fort was rapidly under construction. Fort Abraham Lincoln would later gain notoriety under the command of the infamous Lieutenant Colonel George A. Custer. Camp Greeley (later renamed Camp Hancock) was occupied on August 8th when officers arrived aboard the Ida Stockdale from Fort Rice. Greeley’s occupation marked the first formal settlement in what would become Bismarck. Doctor Burleigh is credited with commissioning the town’s first buildings, including his office and home. Whether those buildings were situated inside Camp Greeley itself are unclear. Nonetheless, several log buildings and tents were erected at Greeley that fall. One of the original log buildings, which has since been covered by clapboard siding and expanded several times, still remains at the site as the city’s oldest surviving building. There are varying accounts as to when the sole surviving building was built, and by whom. Most accounts state that it was one of the initial buildings erected in the fall of 1872, but some do indicate it wasn’t constructed until 1873. It may have been one of the early buildings utilized by Doctor Burleigh. Linda Slaughter – whose husband was the camp’s post-surgeon – established Bismarck’s first school in a tent at Camp Hancock on August 24th. It was a Presbyterian Sunday school called Sabbath School, hosting about six students. The following year, she will be named Bismarck’s first school superintendent and establish the first public school. The new town of Edwinton was nearly wiped out by a prairie fire on October 12, 1872. The fire surround the town on all sides. It was believed to have been started by Native Americans to combat encroaching settlers. From inception, businesses immediately sprung up in and near Edwinton. Railroad and military personnel supported these early establishments, which operated out of tents that were quick to assemble and could be easily relocated. This was important given the ongoing townsite dispute. They would be “papered” and boarded over during the winter. The most notable first businesses included that of Asa Fisher’s billiard hall, John Dunn’s general/drug store, John Yegen’s restaurant and bakery, and the Shaw & Cathcart dry goods store. Some of these originated in Carleton or Burleigh City before moving to Edwinton/Bismarck after the railroad was re-routed. The Shaw store was explicitly said to be located in Carleton in Linda Slaughter’s Fortress to Farm manifesto. Established in or around May 1872, Shaw & Cathcart was likely the region’s first retailer. The store actually originated in Boston as Shaw, Cathcart, & Fisher – a partnership enterprise involving Asa Fisher and W.B. Shaw. The Cathcart connection relates to an affiliation with long-time Saint Paul dry goods merchant Cathcart & Co. At the very least, Cathcart was a supplier, and may have also been a partner. W.B. Shaw – the local proprietor – also had Saint Paul roots, and both men may have resided in Toronto. At some point, the store was relocated to the corner of 4th Street and Main Avenue in present-day Bismarck. One source says Carleton and Burliegh City were established as soon as 1871, but this contradicts other reports and seems unlikely. There was little activity until 1872, certainly not enough to support towns. Carleton City, in particular, was largely supported by the military personnel stationed at Fort McKeen directly across the river, which wasn’t established until June 1872. There are also no discovered references to either town before 1872. Northern Pacific didn’t even award contracts between the Red and Missouri Rivers until September 1871, and Burleigh had not yet commenced grading work as of a June 29, 1872 news article. Lastly, a news report from March 1872 states that surveying was only complete to the James River. Some sources spell Fort McKeen as Fort McKean, but this is inaccurate. The fort’s original namesake was Colonel H. Boyd McKeen, who was a Pennsylvanian officer and brigade commander killed at the Battle of Cold Harbor during the Civil War. A Fort McKean did exist, but not in Dakota Territory.